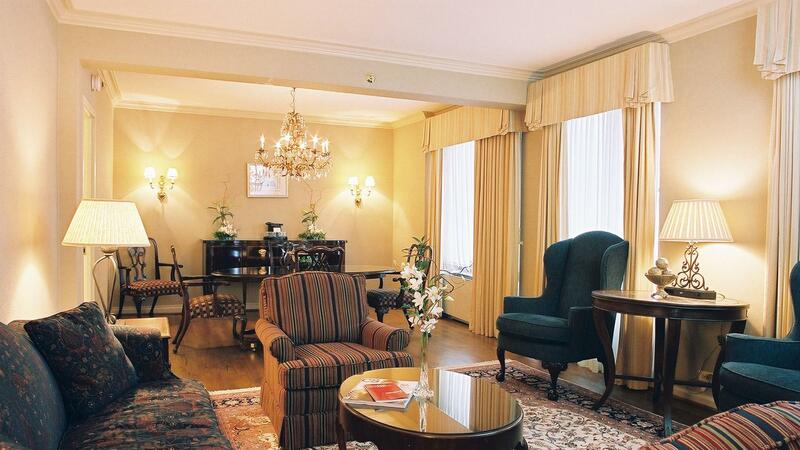 The Whitehall is the choice in suite hotels in Chicago, especially with the Delaware Suite in its doors. This exquisite one-bedroom suite designed with sumptuous colors and textures offers a bedroom with a four-poster king-size bed, dressing area, and private bathroom with marble accents, shower and soaking tub. At 750-square feet, these elegant suites offer spacious living room and dining areas with hardwood floors, 50-inch high definition LED television in living room, a refrigerator, a bar and a deluxe guest powder room. Spacious bedroom features premium Egyptian cotton linens, white silk duvet cover over goose down comforter, exclusive Hypnos cashmere mattresses, restored antique mahogany furniture and writing desk designed with comfort and style in mind, original three-dimensional artwork, Whitehall signature plush robes, a private bathroom with shower and soaking tub, vanity, luxury bath amenities, dressing area, mini-bar, in-room safe, 42-inch high definition LED television, premium TV channels, cordless phone, and amenities. All guest rooms at The Whitehall Hotel are completely smoke-free.